I am probably one of the few that holds Valentine’s Day at arms length–I neither love it nor hate it, but I do find a nice bouquet of flowers (even if a mandatory surprise) a nice break in the day. While I do not begrudge all in-love couples their romantic notions, I have to say that I think of Cruella De Vil, not Cupid, as its poster child. I wonder about the sincerity of the holiday, but more than that I think more generally: if you had a fur coat, wouldn’t you flaunt it, too? That said, one of my favorite parts about the holiday is that my mother always sends me a Valentine’s, and while overlooked in the past, I now look forward to that most of all. I watch the mail for the card she would have purchased at Christmas or in the new year– simple, straightforward, and full–a small card that says big things, and to think of her waiting months to send a card of love, I think of one of her favorite people (to remain unnamed) who said: “Not all of us can do great things. But we can do small things with great love.” In life, I value these little things. 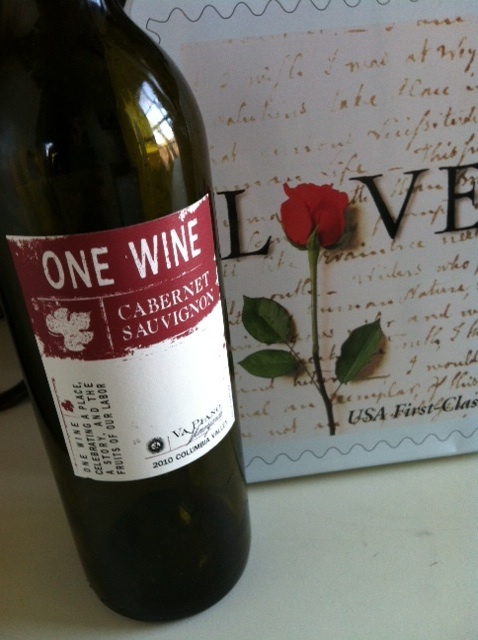 So, this Valentines, I also felt the obligation to open a bottle of wine to mark the holiday. (I say obligation because I am one of the masses who has been hit by a cold). I didn’t want to spend a lot (since my tastebuds were compromised), so I picked up what seemed to be a value deal at Whole Foods. “One Wine,” a 2010 Cabernet Sauvignon from Columbia Valley was a good choice for the day, the flu season, and a nice Valentine’s Day steak dinner. A medium-bodied, black-fruit forward wine with rich tannins and small notes of black cherries and smoke, it cut through the congestion and held it’s own. While flavorful, it lacked a long, balanced finish I had hoped to find in this “deal,” but at $19.99, it was exactly what I was looking for–something inexpensive, simple, and straightforward. It line with the day, it was more homey than showy. Even under the weather, it was a Zone 2 wine–I would definitely have a glass or two, but I don’t feel the need to overindulge.